WASHINGTON—A new report from the U.S. Treasury concluded that a debt default could plunge the U.S. economy into a recession worse than any seen since the Great Depression. As America tries to get through the partial shutdown of the federal government that began Oct. 1, looming ahead is yet another crisis—over raising the debt ceiling. The consensus among economists and financial experts is that as bad as the shutdown has been, defaulting on paying the nation’s debt would be far worse with potentially catastrophic economic consequences. Economist Mark Zandi, Moody’s Analytics, said on the “PBS Newshour,” Oct. 2, the shutdown pales in significance compared to the debt limit. However, multiple media outlets have reported that several Republican colleagues of House Speaker John Boehner heard the speaker say privately that he would not allow a default. They reported that he would break the so-called Hastert Rule, and combine Democrats and Republican votes to avoid a default. The Hastert Rule, an informal practice named after former Speaker Dennis Hastert, would only allow a vote on legislation when a majority of the Republican caucus supports the bill. Breaking the practice acknowledges that the bill could not pass without Democratic votes. How did the federal government get itself into this situation? The government has an obligation to pay for materials and services that it authorized. It has income from taxes to pay its obligations. However, economic conditions affect tax receipts. Debt can mount by budget deficits and in the government accounts, such as the Social Security, Medicare, and transportation trust funds. When the total debt exceeds the income, Treasury needs to borrow to make up the difference. So it sells bonds in the bond market for the amount of the shortfall. Treasury can’t issue bonds without authorization from Congress, which sets the cap. The practice of setting an aggregate limit on the debt began in 1917, according the Congressional Research Service (CRS). 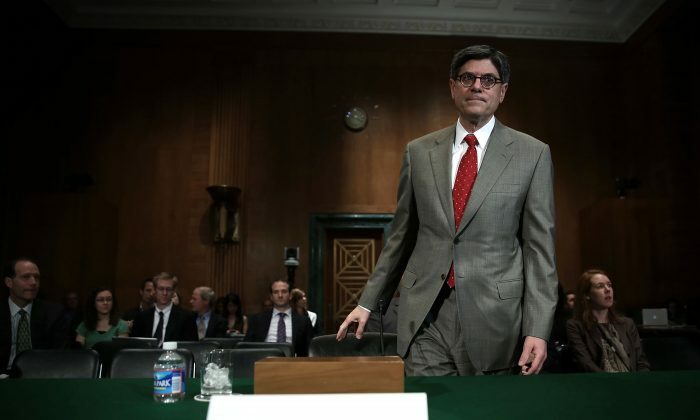 The United States relies on investors from all over the world to continue to hold U.S. bonds, said Department of Treasury Secretary Jack Lew, on Sept. 17. “If U.S. bond holders decided that they wanted to be repaid rather than continuing to roll-over their investments, we could unexpectedly dissipate our entire cash balance,” he said. On Sept. 25, Lew announced that the government will reach the limit of its borrowing authority around Oct. 17, according to Treasury estimate projections. Lew said that the debt limit shouldn’t be confused with new spending. Congress has already approved the spending for which the bills have become due. “Failing to raise the debt limit would not make these bills disappear,” he said. “In 2011, U.S. government debt was downgraded, the stock market fell, measures of volatility jumped, and credit risk spreads widened noticeably; these financial market effects persisted for months,” said the report. The near default of 2011 may provide some clues what would transpire on a default on Oct. 17. “In the event of a default, the U.S. economy could be plunged into a recession worse than any seen since the Great Depression,” stated the report. “Credit markets could freeze, the value of the dollar could plummet, U.S. interest rates could skyrocket, the negative spillovers could reverberate around the world,” are some possibilities, according to the report. Of course, the Treasury is not neutral in the ongoing heated debate, but is a voice of the Obama administration. Economist Mark Zandi, quoted above, and many other experts support its prognosis. The brinkmanship in raising the debt limit in 2011 led to an increase in Treasury’s borrowing costs of about $1.3 billion in fiscal year 2011, according to the Government Accountability Office (GAO), which is nonpartisan.